First of all, this experiment has a high probablility of damaging your webcam beyond repair, so please use an old webcam and don't complain to us if it breaks. The sensor in a webcam is sensitive to both visible and infra red (IR) radiation so the manufacturer adds a filter to stop the IR, otherwise it would produce unexpected results when it took photos. So we want to remove this filter and replace it with one that stops visible light but allows IR through. First take the case apart, how to do this will depend on your webcam. You should find inside a circuit board with a camera assembly on top. There should be a piece that holds the lens, this may screw in and out. If you unscrew the lens you should reveal the sensor chip, this is the part that converts the image projected on it into electrical signals. Keep this safe and clean. You are now looking for the IR filter this is a small piece of glass with a reddish or greenish tinge. If you are lucky it will just come off but in this case it is in front of the lens. We had to push the lens out using a soft pencil protecting the lens with some soft polythene. The filter (top left), lens (top right), and aperture (bottom). Now you want to put the camera back together in the reverse order you took it apart, without the filter. You now want a visible light filter instead. you can use a very heavily exposed piece of negative (the parts of a film you exposed when loading the film), or two pieces of polariser aligned so they are opaque to visible light. Attach the filter to the front of your camera, with some tape, or make some sort of holder for them if you have the technology. In the visible range, turning on this very low powered lamp has virtually no effect on the brightness of the room, compared to the light in the ceiling. The table lamp uses a conventional light bulb, but the ceiling light uses a compact fluorescent, or energy-saving, bulb. In the infra red the compact fluorescent is very dim, it doesn't even light up the room. It isn't wasting energy producing light you can't see. The conventional light bulb on the other hand is probably brighter in the infra red than the visible, so it is is great for our purposes but not very efficient. A candle is also not very bright in the visible. But very bright in the infra red, another not very efficient light source. Plastics that have been coloured with certain pigments become very transparent allowing you to see into this shaver for example. Similarly cola is relatively transparent at these wavelengths so you can see right through it. If you look at a light through a glass of cola it looks a very deep red, which tells you it's becoming more transparent at the red end of the spectrum, so we shouldn't be surprised that it transmits infra-red light. Seeing as a laptop screen depends on polarisers to work, which IR ignores, and it is lit by a fluorescent tube it is unsurprising you can't see a picture. Veins being blue are much more obvious in the IR, it has even been suggested that nurses should use IR cameras to help them find veins to take blood. If we look outside, most things look similar, but vegetation is much brighter than normal. Plants can't use IR for photosynthesis so they may as well reflect it to avoid overheating. Looking at this variegated bush you can see that the presence of green chlorophyll has no effect on the colour of the leaves in the IR. A perfectly normal 5 pound note. In the IR you can see that the queen is not all there. It has been printed with two different inks which look identical in visible light, but one of which is transparent to IR as another measure to make them harder to forge. As is possibly obvious, we at the Naked Scientists found this absolutely fascinating, and I would strongly recommend you opening up a old webcam if you have one you are not attached to!! 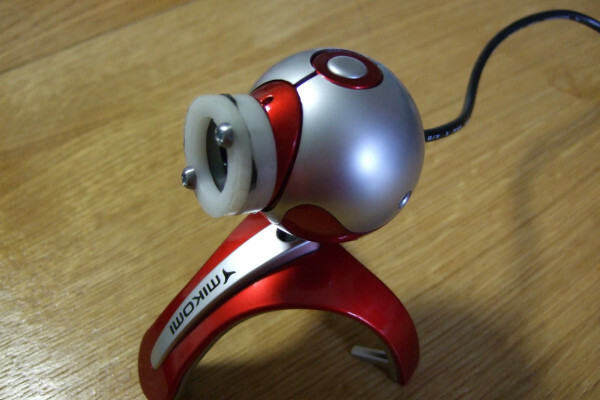 Your webcam has a sensor behind the lens which is sensitive to most colours of light and IR (and also ultra violet). It has a filter on the front which stops the IR, and then a series of filters on the sensor chip itself to only allow one colour through to each sensor on the chip so they can detect different colours. In a webcam the IR is stopped by the filter, and then there are coloured filters in front of each pixel so the camera can determine colour. If we put a visible light filter on the camera only the IR can get through which goes through all the coloured filters. When we just let IR into the camera by putting our filter on the front it will pass through all the coloured filters to slightly varying degrees, as these filters are not designed to stop it. Why is my webcam sensitive to IR anyway? Webcams detect light by having lots of small sensors on a piece of silicon. Each of these sensors is a small diode - a one way valve for electricity, and the electronics is trying to push electricity the wrong way through this diode. This normally doesn't work because a diode is designed so that there are no free electrons to carry an electric current when you try and push electricity the wrong way. But if a photon of light with enough energy hits the middle of the diode it will knock an electron off a silicon atom which can now move and carry electric current. The electronics then measures this current and so how much light has hit the sensor. Any colour of light above the mid infra red (so near IR, visible, UV etc) will have enough energy to do this, so your camera is sensitive to infra red light. More expensive CCD chips found in real digital cameras work slightly differently but on the same principle, so they are also sensitive to IR. Why do painted rays swim along with their nose out of the water? How do octopuses camouflage themselves?